Written by siluvia on 13 March 2013 . In Word 2007, 2010 and 2013, Text Box utility can be used to do many jobs such as position text and graphics wherever you like to locate. But in the earlier version of Word (such as Word 2003), it does not support the usage of Text Box. So, if you want to open and use this word document which contains Text Box in the earlier version (Word 2003), you need to convert the Text Box to frame. 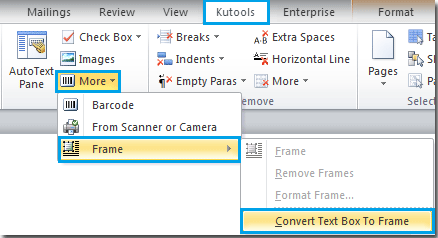 With Kutools for Word’s Convert Text Box To Frame utility, you can convert text box to frame quickly in Word. 1. Launch your Word 2007, 2010 or 2013 application, and open your word document which contains Text Box. 2. Go to File tab, click Save As. Tip: If your document is not saved as Word 97-2003 Document type, you need to save it as Word 97-2003 Document type first. 3. After the Save As dialog popping up, select Word 97-2003 Document option from the drop-down list under Save as type. 4. Click Save button to save the document. 5. 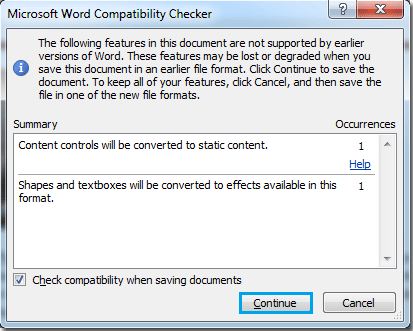 Now, there will bring up a popup dialog with name Microsoft Word Compatibility Checker. Click Continue to finish the saving. 6. Select the Text Box by clicking on it. Click Kutools > More > Frame > Convert Text Box To Frame.